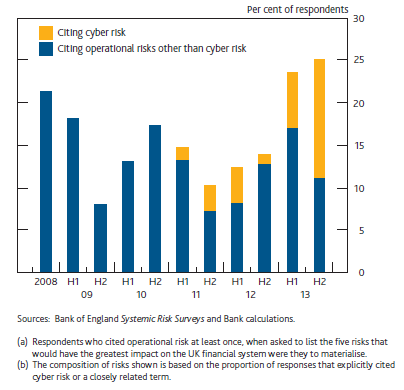 In the Bank of England’s 2013 H2 Systemic Risk Survey Banks and Financial organisation highlighted operational risk as one of the main risks to UK financial stability. The majority of the respondents cited cyber-attacks from individuals or groups seeking to exploit vulnerabilities in IT systems for financial gain or to disrupt services as a significant threat. HM Treasury, other government agencies and financial authorities have formed a Cross Market Operational Resilience Group who will work to assess, test and improve cyber resilience across the core parts of the UK financial sector. On the 12 November, under the supervision of the Cross Market Operational Resilience Group, an exercise called Waking Shark II took place to test the financial sector’s response to a sustained and intensive cyber attack It was an industry led exercise; supported by HM Treasury, the Bank of England and the FCA and several other government agencies. The report on the outcomes and lessons will be issued in early 2014. Banks should be in the top 3 for being the most secured servers in any sector. For several banks to be hacked in any one given year increases customers perception on the safety of their money and private details. This seems to be a trend where as technology develops so will cybercrime…will it be an ever ending vicious cycle?